- An inexpensive alternative to buying a full rack system. - 1U space device or half rack unit is secure for the show. - Setup in minutes. Won't scratch or marr equipment. - Solidly hold's an effect unit on top the amp. - Use it as a portable Music Stand. - No drilling or additions to the amplifier. - Vibration and shock does not affect The Effect Rack. - Uses existing amp handle and friction hold your gear. - Fits inside a soft case with an effect unit. 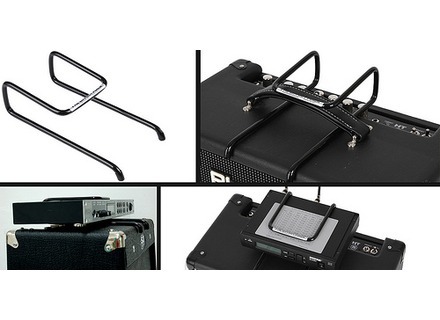 - No bulky rack case to carry from studio to stage. - It works with any amp that has a handle on top. - Even works on a small powered sound system.